Sometimes it’s not the size of the gun that matters — it’s how you use it. 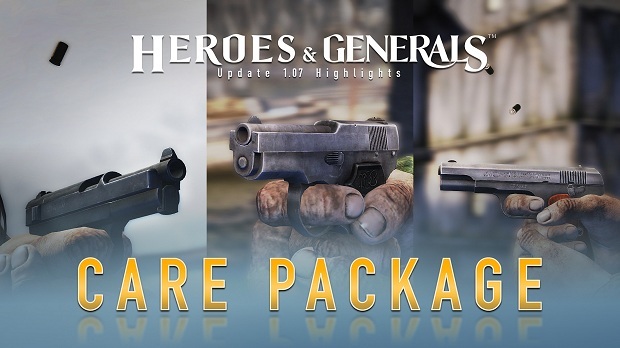 That might be the philosophy behind Update 1.07: Care Package for Heroes & Generals, which adds three pistols — one for each nation — as well as a new sound system that changes what players hear based on whether they can see it. The new handguns are the German Model 1934, Soviet Korovin TK, and American 1903 Pocket Hammerless. All are Tier 1 and available at Tactical Ribbon grade 1, while the game’s previous Tier 1 pistols have been moved to Handgun Ribbon Tier 5. The improved sound system creates a better difference between inhouse shooting and open area shooting. This results in shooting behind objects from your point of view will sound different and more muffled. Update 1.07 also fixes “sometimes invisible wheat fields.” I’m sure that will come as a relief to the NPC farmers who wondered where all their wheat had gone. You can read the full patch notes on the Heroes & Generals site.